Holy Rusted Metal-colored leaves, Bikeman – fall is here, and I hope you commuters haven’t missed out on the lovely leaves spiraling from the trees around your neighborhood. 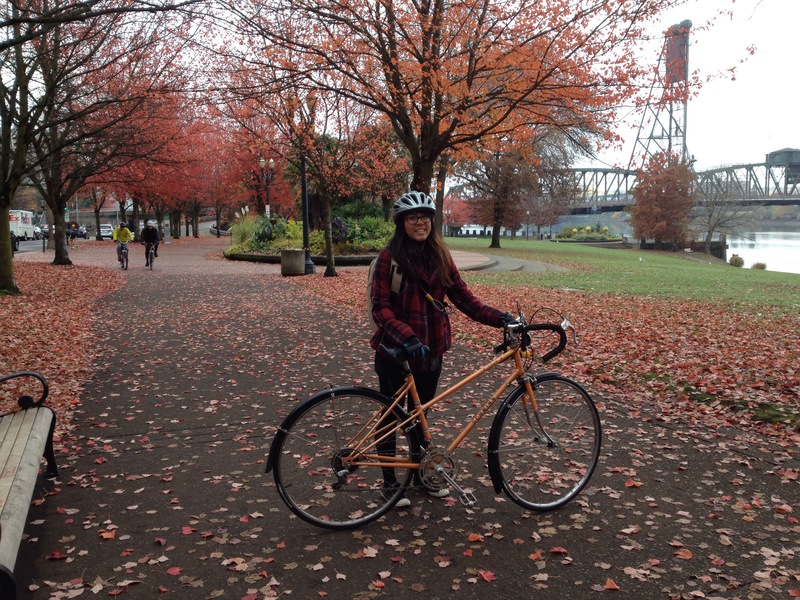 After several years in a less-than-autumn climate known as Hawaii, Mir.I.Am muses on a bike bliss, a.k.a. the awesomeness of autumn commuting! 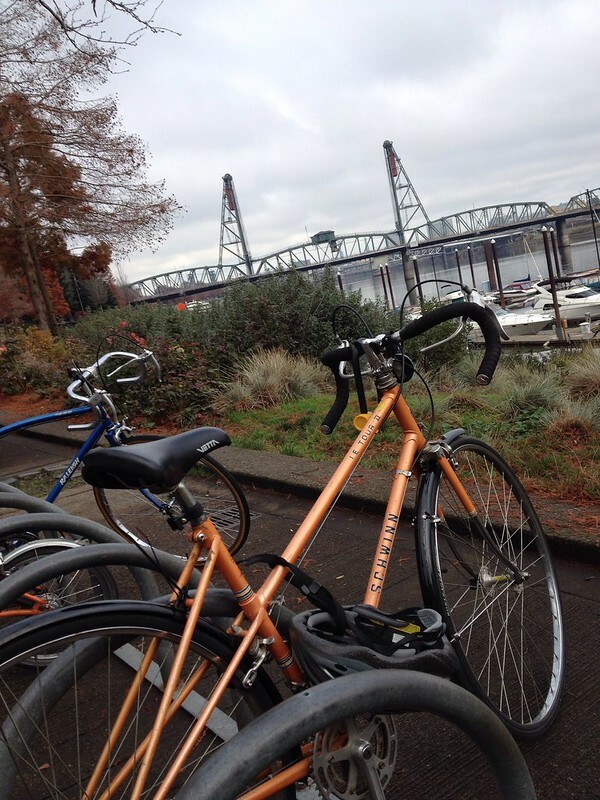 Last week, I was swept away by a colorful, picturesque commute along the river. 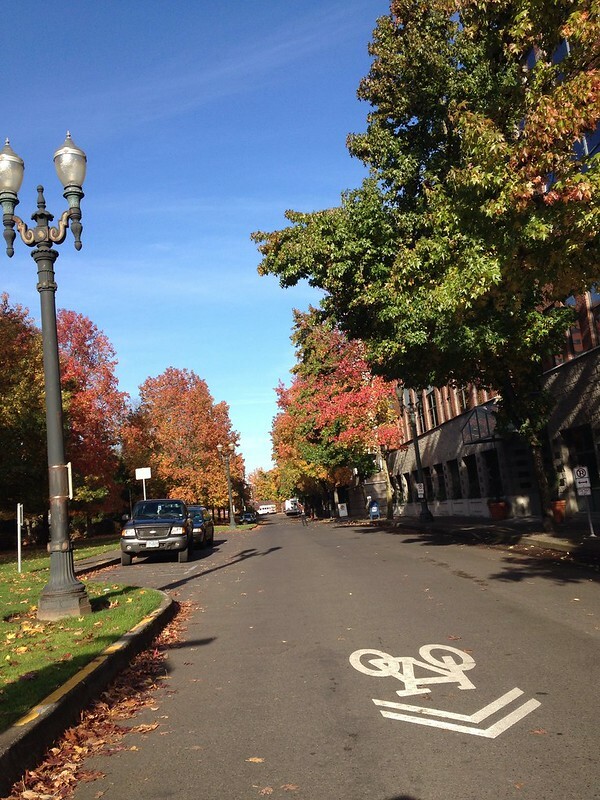 Bike sharrows, blue skies, falling leaves, and a wide greenway was a recipe for Ultimate. Autumn. Bliss. I’ll take a lovely 3-mile jaunt like this at no sweat speed any day… Move over, Portland Streetcar, Cantaloupe is out in full fall force! I’m pretty sure this is one of those fancy bridges over the river. First stop: waterfront coffee at the Bean and Tree and some laptop work time. 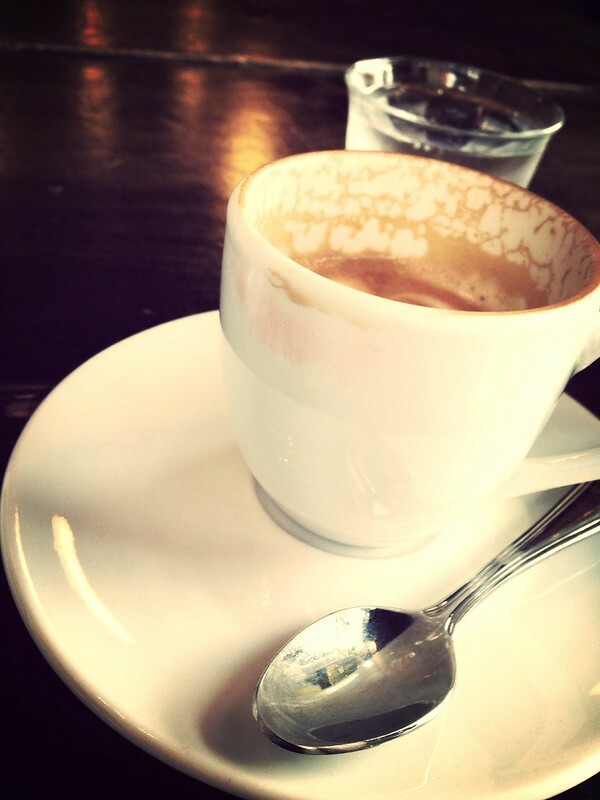 Is it just me, or does lipstick on a cup always remind you of your mom’s coffee? 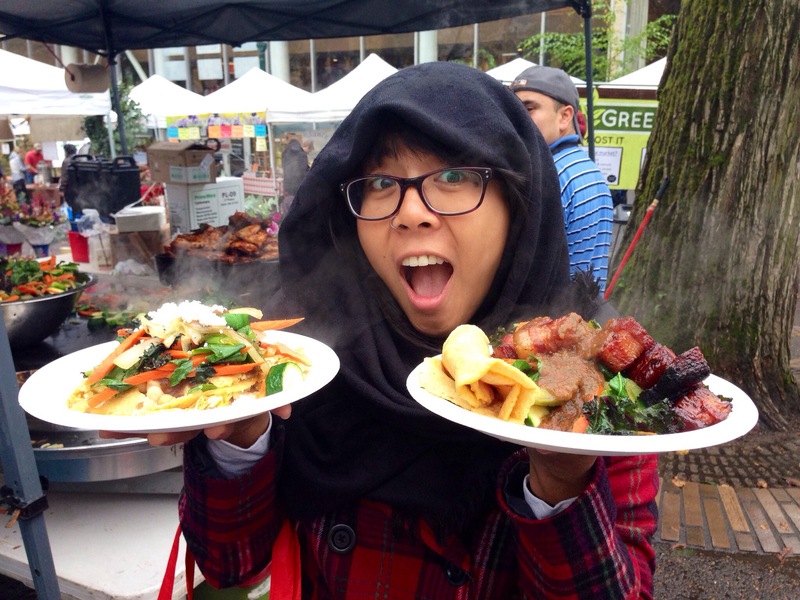 Second stop: Verde Cocina Buenos Dias Breakfast – featuring giant cubes of sweet ‘n’ savory bacon and local greens at the Portland Farmer’s Market. This is food for two cycle humans, by the way. I did not eat this all on my own. And SURPRISE: if you take a new route back home, you might pass by some space tubes. Just kidding! 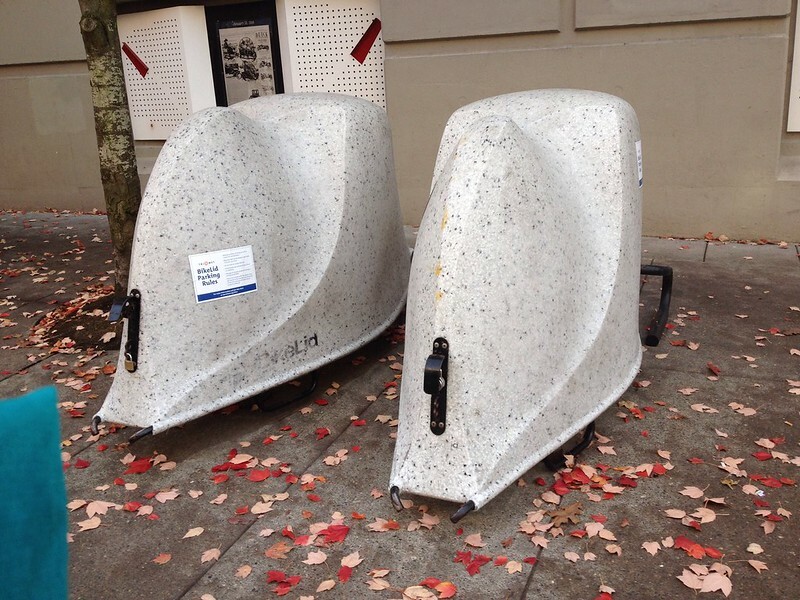 They are lockable rain covers for your bikes. Sometimes it’s worth it to take the long route and enjoy the ride. Forget rushing and cranking and sweating and red light cursing, slow it down for a little autumn bike commuter bliss before it gets too cold. Diggin’ those sweet Cantaloupe fenders…and that awesome cowl you’re wearing! Autumn IS lovely, isn’t it? Florida had nothing like it; I love crunching leaves as I ride (but they do get slippery when wet). Thanks for reminding me about the BikeLid covers. My better half’s work is looking for a secure bike parking solution and while I’d seen those years and years ago in Tampa I couldn’t put a name to them. Now if only I could get my work to bite…..
@Ghost – Oh yeah, those Cascadias do. not. disappoint. In fact – I had LOW expectations for fender performance based on the yellow PB ones I had on my hybrid Kona Dew back in the day – so much rubbing! Either my wheels are slimmer, or I figured out a better mounting setup – but PB did it right with those bad boys. Autumn is the bomb.com. @Raiyn – whoa! Glad I could be of service! Yeah, I didn’t even realize they were called “BikeLids”… until you mentioned it, then I zoomed in really close to the screen and saw the tiny text in the photo. Secure bike parking can be tricky… I usually opt to ask for forgiveness and not permission, and roll Cantaloupe right into the establishment until someone makes a stank about it.